“InfoSmartCity” is the first free app that contains all the amenities of urban traffic in real time, car parks, tourist sites, commercial, public utility and civil protection. Conceived by Mariarita Costanza, protagonist and investor of “Shark Tank”, is made from Macnil Zucchetti Group. “One for all, all for one!”. Nowadays, there are a number of innovative mobile application for smart city services, which promise improved quality of life for those who live the city through their smartphone. 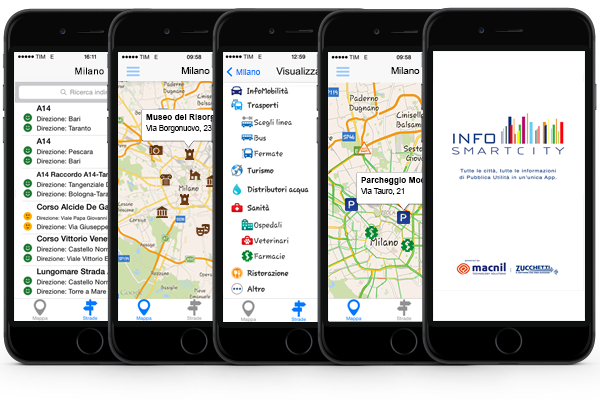 From the management of mobility in cities apps for tourism and events; the search of the car parks to the public interest information: there’s an app for every need. The result is that you only need to download to be perfect “smart citizens” in Milan as many as 22 apps, 17 in Turin and 15 in Rome. For this reason Macnil Zucchetti Group launched “InfoSmartCity” (brochure), a new App that encompasses the existing ones, and aggregates easily offering improved usability for citizens and a unique and effective channel to the service of the Public Administration and Civil protection for urgent communications, regarding mobility, weather, public health, and more. The App can be downloaded free-of-charge from the Apple Store and Google Play, is connected today with more than 30 Italian cities, including all the regional capitals, to constantly monitor the situation of urban traffic, showing the location of the main tourist sites, parking lots, on duty pharmacies and much more depending on the municipalities involved. The information on InfoSmartCity are constantly updated and the goal of the developers of the Zucchetti Group is to cover soon all the Italian municipalities that through this app will have the ability to send public service messages directly on your smartphone of the citizens, to report situations danger and warning of Civil Protection. The App was created by Mariarita Costanza, CTO of Macnil Zucchetti Group, and familiar face to television audiences for participation as investor (Shark) to the first Italian edition of the successful business format “Shark Tank” on Italy. 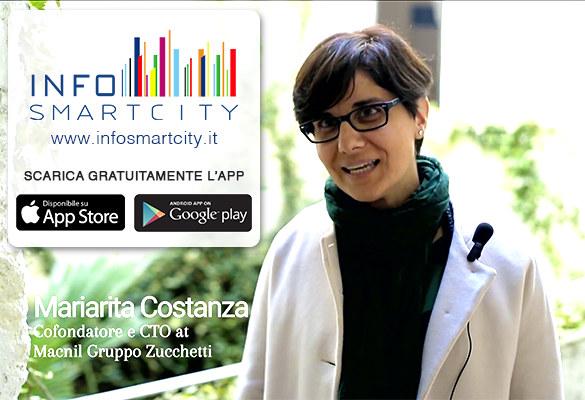 InfoSmartCity also received the “Smart Communities” Premio Smau Milan 2014 and the recognition OpenGeoData 2014 “for having developed the best Free app available on AppStore, which manages geographic and alphanumeric data available, both dynamic and static, as well as geo-referenced data processed in real-time, useful to make them smarter and more livable cities”. Some cities have already chosen InfoSmartCity also to provide other information in the public interest, such as: bus schedules, special parking lots, parking meters and scratch card sales points, environmental islands, location offices and timetables, and the incoming date information even on bike sharing and car sharing. An app that you do not replace all other existing mobility in the smart city, but simply integrates, automatically moving from one city to another, without downloading additional applications. Especially useful for those coming to town for business or for pleasure, InfoSmartCity will show you the traffic situation in real time, all the available parking, location of tourist sites, and all public utility information that the municipal government will choose to share with users, to improve the efficiency of their urban environment, reduce costs, enjoy a high quality of life.